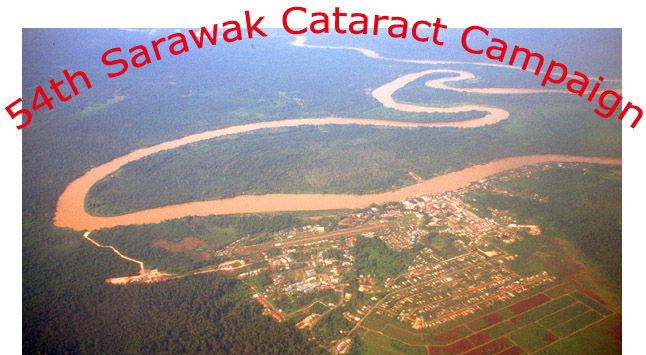 The 54th Sarawak Cataract Campaign was successfully launched in Marudi General Hospital between 10th to 12th November, 2007. 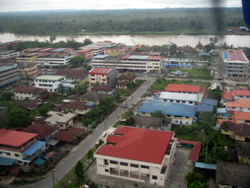 Marudi is the biggest town along the Baram River which is the second longest in Sarawak. 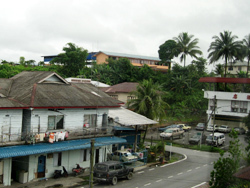 It has a population of about 5.000 within the town and another 17,000 within its vicinity. There is no ophthalmologist in Marudi and patients with eye problems are seen by the medical assistants who had had ophthalmic training. 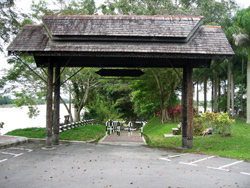 They are responsible for treating common eye problems such as conjunctivitis and corneal foreign bodies and referring more difficult cases to Miri General Hospital where there is an ophthalmologist service. 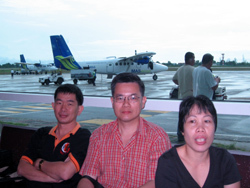 The operations in this campaign were conducted by three ophthalmologists, Professor Chua Chung Nen (from the Ophthalmology Department, Faculty of Medicine & Health Sciences, UNIMAS, Kuching) Dr. Asokumaran (from the Ophthalmology Department, Sarawak General Hospital, Kuching) and Dr. Daisy Kho, (a private ophthalmologist from Bintulu). 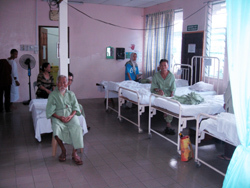 They were supported by ophthalmic nurses from Sarawak General Hospital and Marudi General Hospital. 54 patients with poor vision were collected by the medical assistants 3 months before the visit. 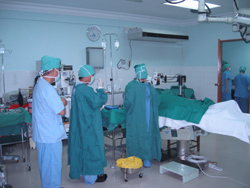 Of these, 24 patients with severe cataract were selected for cataract extraction and implants. 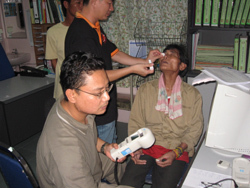 The remaining patients either had refractive errors, moderate cataracts or advanced glaucoma were referred accordingly to either the town opticians or Miri General Hospital. All the operations were reviewed by the team the next day and one week later by the medical assistants. Map showing the location of Marudi. 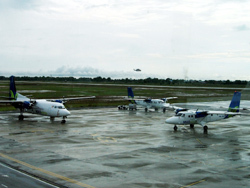 Fokker planes for inland flight from Miri Airport. 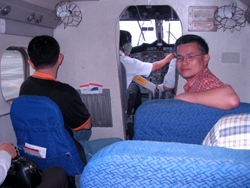 Inside the small plane that could accommodate only 14 passengers. Front seat gives good aerial view. 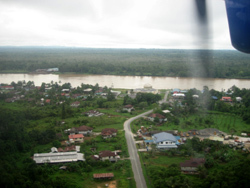 Arriving at the outskirt of Marudi after 15 minutes flight. Over the town centre. The airport is less than 1/3 km from town. View from the hotel. The orange building on the hill is the Chung Hua Primary School. 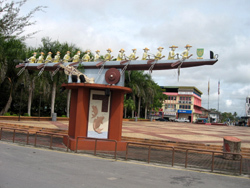 Symbol of Marudi at the town square featuring the annual Regatta or Boat Racing. 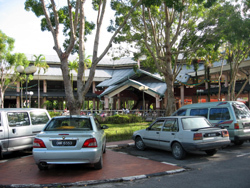 The town market and food court. A favorite place of gathering in the morning. 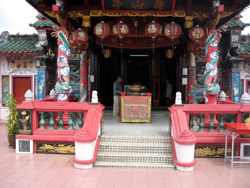 The oldest Chinese Temple in Baram District. 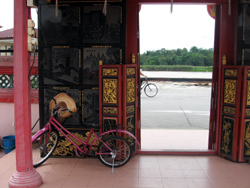 The gate of the temple is facing the Baram River. The Fort Hose on Fort Hose Hill. 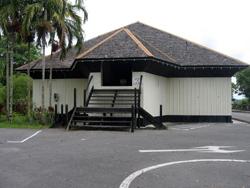 The inside is a museum. 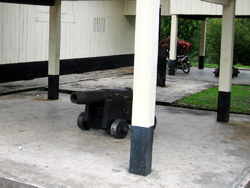 The canon at Fort Hose. It is now used only to announce the beginning of the Regetta. 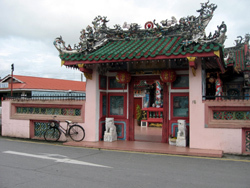 The gate opposite Fort Hose that leads to the footpath at the hill slope connecting the Fort to the town. 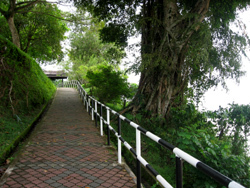 Footpath down the hill slope by Baram River. 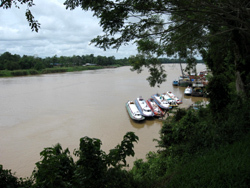 Speed boats at the foot of the hill linking Marudi with villages along the Baram River. 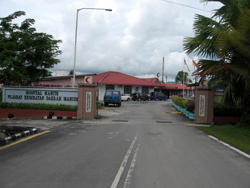 Marudi General Hospital. The hospital is opposite the airport atop a hill. Meeting before the beginning of the clinic and operation. 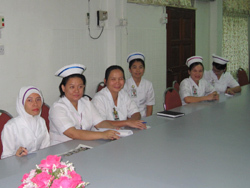 Nurses from Marudi General Hospital. 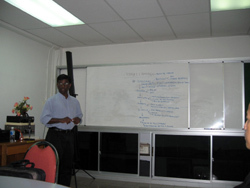 Dr. Asok briefing the staff of Marudi General Hospital. 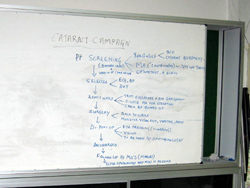 The flow chart of the Cataract Campaign. 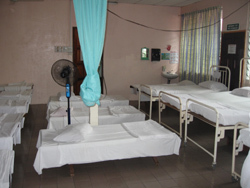 Beds ready to admit patients for cataract surgery. 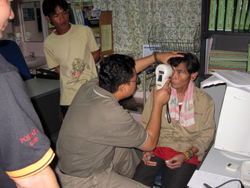 A Kayan patient with sight problem. 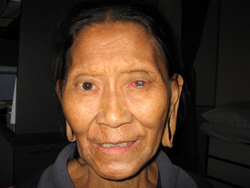 A Penan patient with cataracts. 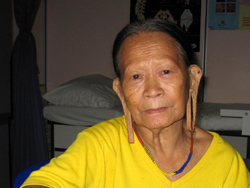 Her earlobes were elongated due to years of wearing heaving earrings. 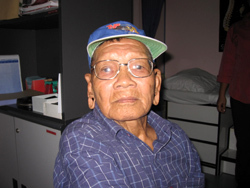 This Penan patient turned up in emergency after trekking through jungle. She had a left corneal ulcer with hypopyon. 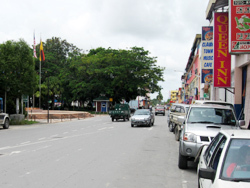 She was transferred to Miri for intensive antibiotics. 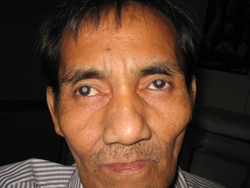 An Iban patient with bilateral dense cataract which reduced his vision to light perception. IOL calculation was performed on the portable machine. 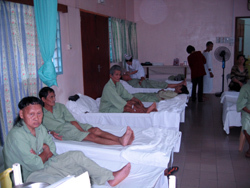 Male patients admitted from the clinic for operations. Patients getting ready for operations. Operation inside Marudi General Hospital theatre. 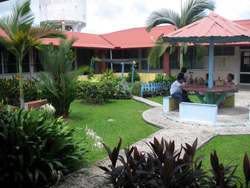 The garden inside the hospital. 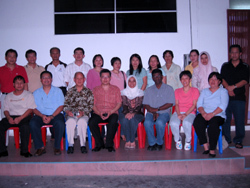 Dinner with Dr. Maslina (head of the Marudi General Hospital), Matron and Dr. Daisy Kho. 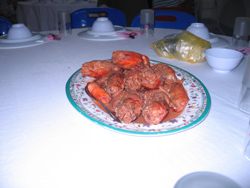 Giant prawns from the Baram River. After dinner photo with the all team for a local Chinese newspaper. Sent off by friends old and new. 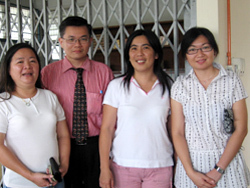 Lucy Wong, Sim Ai Tee and Dr. Chua (head of the dental department from the Marudi General Hospital. (from the left).